Elegant window coverings must additionally deliver on privacy, practicality, and a long life. For this reason we offer the highest-grade products in shutters in Minneapolis. In addition, we’ll also custom style your shutters to seamlessly fit your windows and match your décor. Browse through all the window treatment products you can have in your home. With more than three decades of unexcelled customer service and quality, we sell superior shutters you can install in your home without hesitation. Plantation shutters are the choice window treatment in Minneapolis, because they’re energy efficient, enduring, and charming. Their louvers are large and are a breeze to adjust to control the amount of light you wish – and look beautiful, in all of your rooms. Polywood® plantation shutters are a non-wood shutter that gives you extra control over temperature, light, noise and privacy. 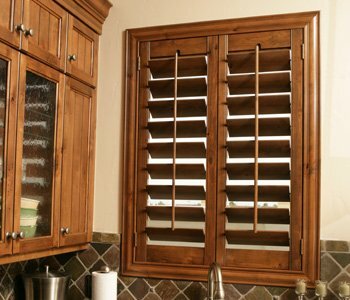 Ovation® wood shutters are long-lasting wood plantation shutters created from furniture-grade teak. And reclaimed wood shutters are fashioned from certified upcycled wood from fences, buildings, and barns. Looking for shutters that enhance your style? Our experienced installers and designers can help you select from a selection of paints and stains to go with your rooms. Learn about your color options here.